I’ve only recently discovered a world of Turkish sweets that extends far beyond lokum and the ever popular syrupy baklava. Take these lemon meringue cookies for example. Just when you think you’ve seen and eaten every imaginable cookie, someone decides to spread meringue on cookie dough, roll it up, bake it, and unsurprisingly, it tastes pretty darn fantastic. The cookies expand slightly in the oven and come out resembling a rose while smelling like a combination of nutty butter and lemon peel. Biting into one reveals a range of magical textures from tender crumbly cookie to meringue that is soft in the middle and slightly crisp around the edges. I haven’t yet managed to stop at just one. This recipe lends itself to many variations. Chocolate with crunchy hazelnut meringue or an applied thin layer of cumquat marmalade come immediately to mind. Do let me know if you happen to experiment with any other flavours! In a food processor (or Thermomix), combine the egg, sugar, butter and salt. Process until creamy. Add the flour and baking powder, processing until a dough just forms. Press the dough out into a flat disc, wrap and chill for at least 30 minutes. When ready to bake the cookies, preheat the oven to 160’C. Make the meringue by whisking the egg whites and salt in a mixer until foamy. Gradually add the sugar, whisking until the meringue is stiff and glossy. Stir in the lemon zest. Roll the dough out to a rectangle roughly measuring 12″ x 9″, with the longest side of the rectangle facing you. Spread the meringue on the dough, leaving a 1″ border all around. Gently roll the dough up. This may be a bit messy as the meringue will try to escape a little but it’s worth persevering, I promise. Cut the log into 12. Arrange the cookies cut side up on a lined baking tray. Bake for 20-25 minutes until the cookies are golden. Divine! Those are very original. I’ve been on tenterhooks waiting for this recipe after seeing you gram it. Post exam baking here we come!!! Mmmm, looks yum! Definitely something new and a little bit different. Interesting cookies, Y. I would love to try these! Great creativity! I love the idea of these cookies! OH… MY… i have to try these! sounds like a two person job that rolling up; maybe i shall take this recipe down to my mum’s to make together. how extraordinary – i have never heard of such a thing! if this is turkish baking – more please! This recipe is crazy good! Combing two of the best comfort sweets ever invented. 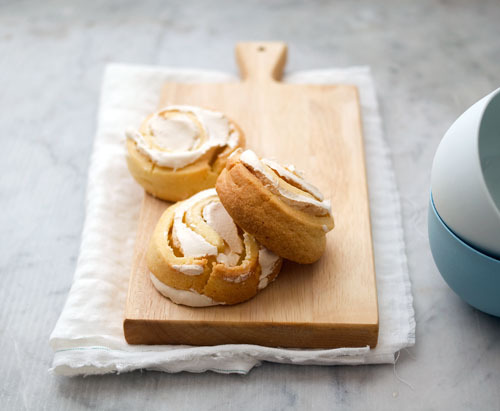 The humble cookie and the lemon meringue. Genius! I think 12? x 9? is bit small. I have case of large size. If cookies are larger, Its more bits and more delicious to eat. Made these yesterday and thought I was going to have a disaster! the pastry seemed too soft and thick, it was messy and when I cut them they flattened out. However I baked them anyway and a miracle happened in the oven. They were delicious, just as promised. Didn’t look as good as yours but will definitely be making them again. Cathy : Hooray for miracles! And thanks for your comment 🙂 For next time (if you’re feeling brave) : if the pastry seems to soft, you can roll it out into the rectangle and chill it before filling with the meringue and rolling up. Those cookies look delicious. I am so fascinated, meringue and cookies together. I will give this recipe a go. I just hope they turn out as lovely as your cookies. I just made these over the weekend and they are amazing… The entire book is amazing! I borrowed Turkish Bakery Delight from the library but I think I might need my own copy! I unfortunately had loose and abundant meringue so my cookies were a hot mess but still so good to eat 🙂 I added some yuzu juice to the dough though as I wanted some sourness. Haven’t made these cookies but could taste the flavours as I read the recipe. 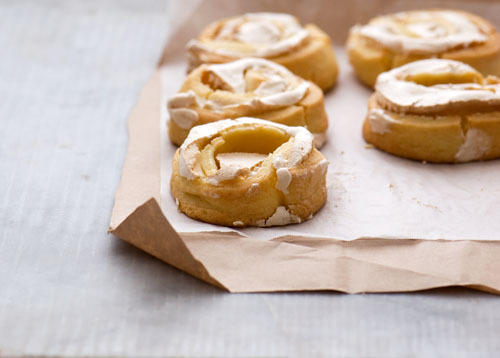 I would cover rolled out pastry with lemon curd, roll up, cut into rounds & put meringue on top & bake.